Garden view in September showing the blue spruce Picea pungens 'Rovellis Monument' in the foreground, and Metasequoia glyptostroboides 'Gold Rush' to the rear. Is this your garden? and if so - are you open for the NGS? Yes, all photos are taken from my garden, but no, we are not open for the NGS. Although this year we are open for members of the British Conifer Society on Sep 1st and by appointment only for anyone on Sep 2nd. Details on BCS website. Hi Bluespruce, great photos. I've never really appreciated conifers, I've really only seen them used as a substitute for fencing. The mixture of colours and shapes here is fantastic. wow what a beautiful garden you have so much colour and texture, really stunning - my mum would love it she has lots of conifers and evergreen plants in her garden,- but being a florist i only have two small ones in pots, i save the space in my garden for flowering plants - but even not being a fan of conifers myself i can really appreciate what you have done with them. absolutely beautiful! The colours in this picture are truly amazing. I came back to this picture to add it to my favourites. Such a great mix of coloured foliage. Congratulations on this garden design and the photo itself. Could you please give some details of the low-growing plants ~ including the creamy ones and purples. Thanks. Terratoonie, the low growing plants are all heathers, the golden/yellow heathers are a variety of the winter heath Erica carnea, the purple ones are summer flowering Calluna vulgaris varieties. I hadn't realised the heathers came in so many shades. You planned the plot well to get such a good colour scheme. That blue spruce is one of the prettiest I have ever seen. All of these colors are splendid! Beautiful, I do envy you being able to grow conifers, sadly where we are it is impossible, fantastic colours. Dottydaisy2, I'm interested as to why you can't grow conifers ? We live near the sea, and the salt wind does not help, we grow three a juniper and pinus species, we used to live in the midlands where we grew lots of different varieties of heather and conifer, and I do miss their beautiful colours I just liked the shape as well, still you cant have everything can you? 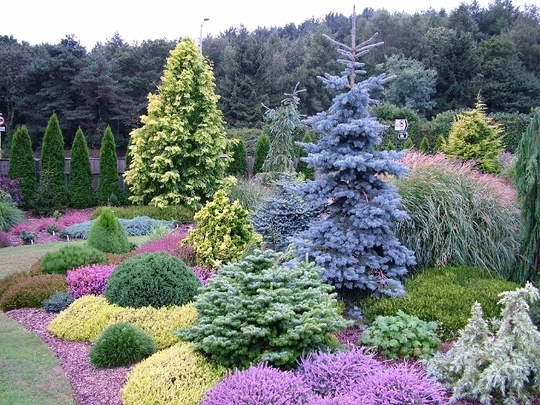 This must be one of the best conifer gardens I have seen, and I am not a lover of conifers at all, beautifully planted.I notice you have a nice grass in the photo, which one is it? Wonderful.. Wish it was mine. Fabulous photo - Please can you tell me how old and how tall is the Gold Rush? Have you fed it at all? The Gold Rush is about 6-7 meters high this year and is only about eight year old, and no it doesn't get fed. seems to grow as fast as the species. catfinch, no, not been to see the Redwoods in California, the closest I've been is LA Airport on route to Portland in Oregon...perhaps one day? I suggest that you Google it for now..you will enjoy it..what were you in in Portland for? I lived not far from there..for many years? I was there for an American Conifer Society national meeting a few years ago. If anyone needs winning over to the beauties of conifers & heathers Bluespruce they need only look at that photo...lovely. Hi Fluff, many thanks for your kind comments, I do my best to try and promote the use of conifers in gardens but they are still not regarded as fashionable, and unfortunately many gardeners still seem to follow fashion when it comes to choosing plants. I think the thing is Bluespruce that many folk have only seen conifers as tall, colourless trees that go brown in the centre & stop other plants from growing under them...they grow too tall & wide & smell too strong! And yes...they are often found in old, long-established gardens so are seen as old-fashioned...a bit like quince trees! I've just had a look at your photos tho' & some of them...most of them... are stunning! The different shades ...the shapes... & the way you can plant them in such lovely formations with a bit of imagination is great. You'll have to make it your mission in life to promote the wonders of conifers!! oh, wow, the range of foliage colours ... stunning. Thanks for sharing! I tried to find out more about the plant, Blue, but the four plant-finder sites I have on my faves all turned up zero, and Google only gave me you on GoY, plus one other - are you on another site? because that also had "Gold Rush to the rear"! Sorry Fran, been away for a while, what info are you looking for on the 'Gold Rush' ? just general info, I think,lol can't remember that far back now! It looks too big for my space, I think i was just looking for general details as I likjed the colour and shape and it was a new plant to me, so was itnereested in finding out more. This photo was taken at Foxhollow.